EML Viewer Pro is a Windows software tool for managing directories of Outlook EML files. If you have hundreds or thousands of EML files that you need to search and convert, then EML Viewer Pro is a solid tool for that task. But what if you are a Microsoft Outlook user and you want to convert your Outlook email messages into the open EML file format? Microsoft does not natively support converting email into .eml files. Fortunately this task is easily accomplished by downloading the MessageExport add-in for Microsoft Outlook. 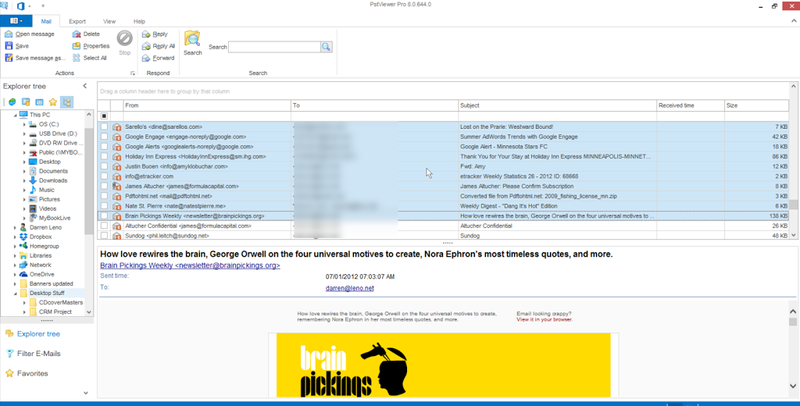 MessageExport will install directly to the Outlook toolbar. It is compatible with Outlook 2003, 2007, 2010 and the upcoming 2013, both 32 and 64-bit. To use MessageExport, first select the email messages in the mail list that you want to convert into .eml files. Next, choose “Export to EML” from the drop down list. Finally, click the blue “Export” button to begin the eml conversion process. You may be prompted to select a folder where the .eml files can be stored. MessageExport can convert one, hundreds or thousands of Outlook emails into .eml files. The .eml files that are produced can be opened with EML Viewer Pro, or with any email software that supports the RFC-822 EML file format (which most do). There are many, many other options in MessageExport. For example you can have it automatically convert email into .eml files on a scheduled basis. You setup a specific naming scheme based on information in the email. You can also export to msg, pdf, and other formats. Click here to learn more about MessageExport and download a free trial. The free trial runs for 15 days. After that you can continue to use MessageExport to convert individual email messages to .eml or any of the many other formats that it supports.